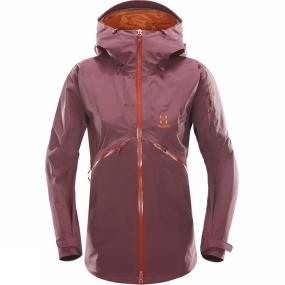 A minimalistic jacket built to complement your freeriding and keep you dry and warm when you're out in the snow, designed for the enthusiast.The Hagl�fs Women's Khione Jacket is designed to fit your body, to move as you move, to keep wind and water out and to be easily transportable and packable. Two-layer Gore-Tex provides the waterproof, breathable protection, with a face fabric that is soft to the touch and comfortable.The hood will fit over your helmet and is adjustable for versatility. A fold-away snow skirt adds to the comfort. Pit zips provide ventilation, and the areas of movement are ergonomically designed to complement your natural motion. It's built to function.